This subsection includes the alluvial plains of the Amargosa Desert, Sarcobatus Flat, Stewart Valley, Pahrump Valley, Mesquite Valley, and California Valley. ... Black Mountains, Greenwater Range, Resting Spring Range, and Nopah Range between Death Valley and the Amargosa Desert and Pahrump Valley. 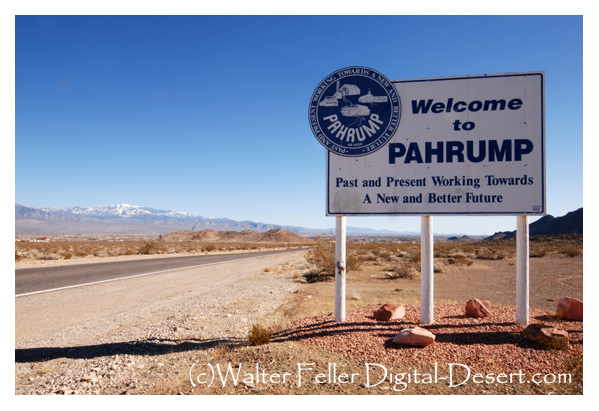 Corn Creek was claimed by the Las Vegas Paiutes, whose territory, according to Kelly, included Pahrump and Las Vegas valleys, and part of Amargosa Valley, . Amargosa Desert - Pahrump Valley. The alluvial plains of the Amargosa Desert, Sarcobatus Flat, Stewart Valley, ... Funeral Mountains - Greenwater Valley.